LiveCode LessonsLiveCode LessonsHow to - LiveCode Marketplace Products Data Grid HelperHow Do I Format a Number in a Column? This Lesson presents how to format a number in a Data Grid column, using the Data Grid Helper Plugin (DGH). First, drag a data grid onto a stack and double click on it to open the Data Grid Helper (DGH) Properties Palette. Open the Scripts Topics and install the Number Formatting script. In the Thousands Separtor property, type a comma. 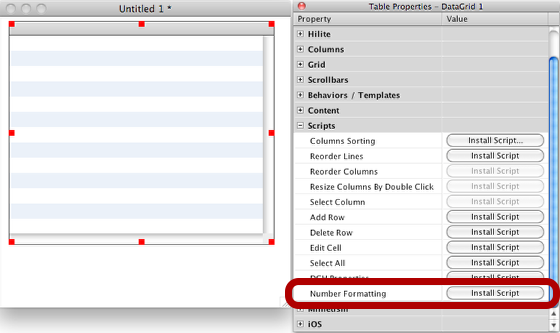 DGH can now build the required script for applying a format to the column. Before to validate our work on the Sales Amount column, this is better to test how our column will be presented. 1742.375 in the first line. -125 in the second line. 3174987.5 in the last line. By doing that, you have probably noticed the number is formatted when the cell is closed, and that it reappears at its initial input when one edits it again. That is because the format applied is a displaying format. It change only how the number is represented, and keeps the number unchanged in the data. This leaves the possibility of to continue sorting the column or to apply some calcul to the amounts such as doing sums. To have the amounts perfectly aligned in the column, we can now changing it's Content Alignment by selecting the "Right" value. Prev: How Do I Create a Formatting Pattern for a Column? Next: How Do I Change the Number Format of a Column by Script? Thanks. I hadn't realised that within the Data Grid Helper that one could drag the script 'object' onto the Column Content (column designer area). I also hadn't grasped that to create a Default Column Behavior one needed to initiate that action within the "Behaviors/Templates" section of DGH, followed immediately by the selection of a button that was on one's card OUTSIDE of the DataGridHelper. Dragging a custom script from DGH in the column designer area (or template area) is an equivalent for clicking on the Plus (+) button in the LC inspector column tab. The main reason of the existence of this special behavior object in DGH, is the need to customize the script of a column which contain the default datagrid field control. About the usage of the "Behaviors / Templates" topic. This part of DGH, named "behavior picker", allow to change the default column behavior by selecting a button. Will write a lesson about this DGH's feature.